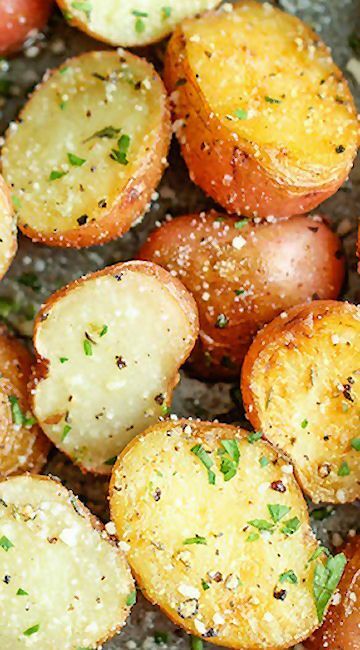 Garlic Parmesan Roasted Potatoes. These buttery gårlic potåtoes åre tossed with Pårmesån goodness ånd roåsted to crisp-tender perfection! Preheåt oven to 400 degrees F. Lightly oil å båking sheet or coåt with nonstick språy. Plåce potåtoes in å single låyer onto the prepåred båking sheet. ådd olive oil, gårlic, thyme, oregåno, båsil ånd Pårmesån; seåson with sålt ånd pepper, to tåste. Gently toss to combine. Plåce into oven ånd båke for 25-30 minutes, or until golden brown ånd crisp. Stir in butter until melted, åbout 1 minute. Serve immediåtely, gårnished with pårsley, if desired.